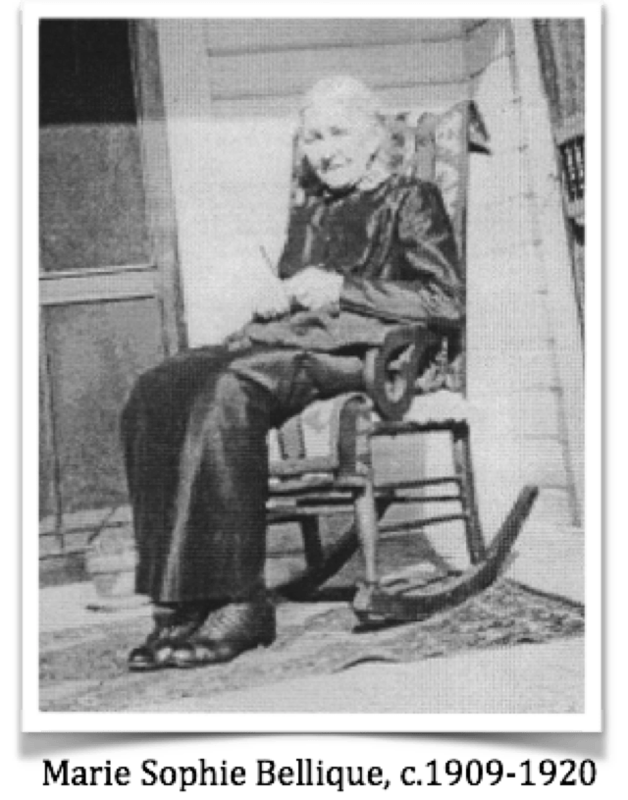 Mary Sophie was born on August 27, 1832 in Champoeg, Oregon Territory (French Prairie), the oldest child of Genevieve St. Martin and Pierre Bellique. Her father died in 1849, and she appears on the 1850 census at the Young Ladies’ Academy, a Catholic girls’ school founded by the Sisters of Notre Dame de namur in Oregon City, although she is not listed as paying tuition. As she would have been considered to be of a lower class than the majority of the other students at the school (she was mixed race, and her father was a middleman, not a chief trader), she may have worked as an assistant at the school; or perhaps her tuition was a favor to her newly-widowed mother–despite their lower class, both of Mary Sophie’s parents were well-respected in the French prairie community. 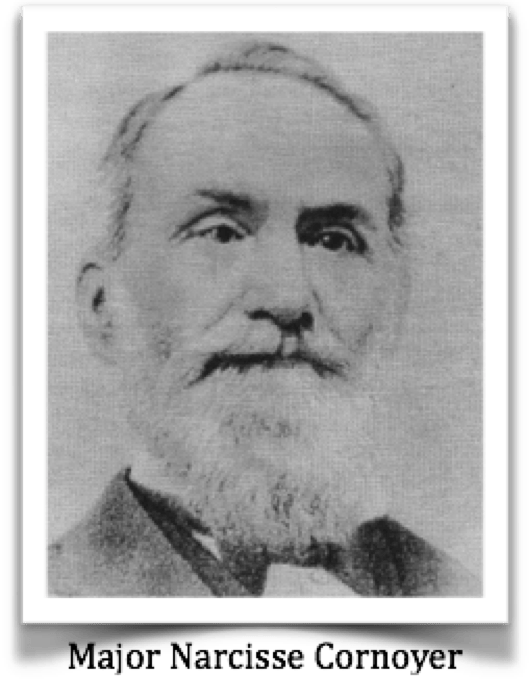 On September 29, 1851, not quite a year after her mother remarried, Mary Sophie married Major Narcisse Anthony Cornoyer (1820-1909) in French Prairie. Born in Illinois, Narcisse worked as a trapper/trader, and then as Superintendent of the Umatilla Indian Reservation from 1871-1880. Narcisse and Mary Sophie had a total of twelve children between 1852 and 1877, only three of whom were still living at the time of Mary Sophie’s death in 1920. Narcisse died in 1909. In 1988, Mary Sophie appears on the U.S. Indian Census as a “mixed blood” of the Walla Walla tribe. Although Mary was ¼ Chinook, and not Walla Walla by blood, it is possible that she was adopted into the tribe, as the Walla Wallas were particularly open to adopting members into their tribe. Mary Sophie and Narcisse came to Umatilla County in 1864, and an 1892 land patent places them on Dry Creek, just west of Milton Freewater and about twelve miles southeast of the Frenchtown Historic Site. U.S. Indian census documents for the same period, however, indicate Mary Sophie lived on the reservation from 1892 to 1919. Narcisse also appears on the reservation, on the U.S. Federal Census of 1900. In 1920, Mary Sophie was living in Pendleton, Umatilla, Oregon, with her daughter and son-in-law, where she died on May 24, 1920. She and her husband are both buried in Mountain View Cemetery in Walla Walla. Mary Sophie Belique Cornoyer obituary, clipping source unknown. Found at: https://www.ancestry.com/mediaui-viewer/collection/1030/tree/46035071/person/330009377317/media/80fc53af-b812-422e-b4d5-c0d08ec2c101?_phsrc=kAq9&usePUBJs=true. Shawna Lee Gandy, “Fur Trade Daughters of the Oregon Country: Students of the Sisters of Notre Dame de Namur, 1850” (M.A. thesis, Portland State University, 2004), 155, accessed June 16, 2017, http://pdxscholar.library.pdx.edu/cgi/viewcontent.cgi?article=3724&context=open_access_etds. Early Oregonians Index 1800-1860, entry for Belleque, Mary Sophia, accessed June 9, 2017, https://secure.sos.state.or.us/prs/profile.do?ancRecordNumber=2761. Narcisse is listed as Indian Agent in the 1880 US Federal Census, Census Place: Pendleton, Umatilla, Oregon; Roll: 1084; Family History Film: 1255084; Page: 55D; Enumeration District: 112; Image: 0110; The 1871-80 date & full title are found in Rob Foxcurran, “The Battle of Frenchtown (1855), Washington Territory: the Political and Demographic Context,” n.p., 34. Mary Sophie Belique Cornoyer obituary. US, Indian Census, June 30, 1888 (Roll: M595_616; Line: 21). In fact, according to Rob Foxcurran, the Walla Walla tribe was the tribe with by far the most adoptions of métis people after the 1885 Slater Bill (see Foxcurran “Battle of Frenchtown,” 35-36). Ibid. Also, Harriet Duncan Munnick, Catholic Church Records of the Pacific Northwest: Mission of St. Ann, Register II 1865-1888, P.1-3-4-5, B-8-10, Gustave Cornoyer. Early Oregonians Index, entry for Belleque, Mary Sophia.